Iowa’s governor joins her counterparts from Nebraska and Missouri to talk about flooding. The governors of Iowa, Nebraska and Missouri are asking the Army Corps of Engineers to come up with more flood-prevention solutions. The three governors and Army Corps officials met this in Council Bluffs and plan to meet again in three weeks. Iowa Governor Kim Reynolds told reporters the Corps must make “flood management and people” their priority. “We can’t continue to experience the type of floods that we’ve gone through here in the last recent days,” Reynolds said during a news conference. Nebraska Governor Pete Ricketts delivered the same message. And Missouri Governor Mike Parson amplified the point. 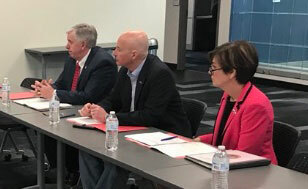 Reynolds said the three governors are ready to lobby congress for changes in Army Corps regulations that have governed how the Missouri River levee system is managed. Reynolds indicated the governors have asked the Corps to ensure any temporary construction to repair damaged levees can be part of the permanent levee system. Missouri’s governor suggests state officials should have “a more active role” in making the decisions about long-term river management. Travel difficulties prevented the governor of Kansas from attending today’s gathering and she plans to be part of the next meeting in three weeks.